October of last year, I was walking inside SM Megamall when my attention was caught by a big booth of the airlines of Cathay Pacific Air a few cartwheels away from the main door’s entrance. 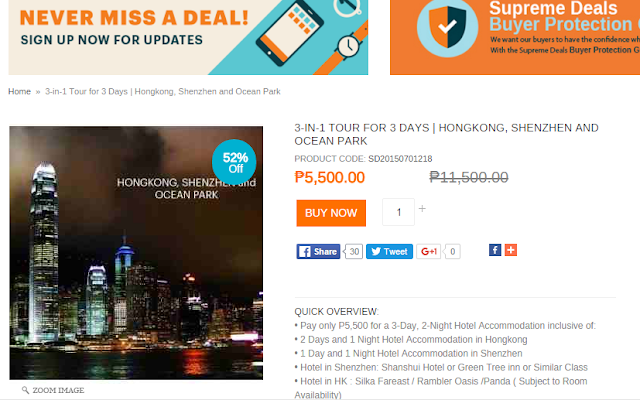 Being a travel – addict and interested about travel hacking, I am always on the lookout of travel brands that are giving promos, tricks and discounted prices to anyone who’d like to travel for almost free flight. I have no plans to book a flight that time considering that Cathay Pacific Air is not a budget airlines. I am a backpacker type of traveller, I usually fly via Cebu Pacific Air or Air Asia. 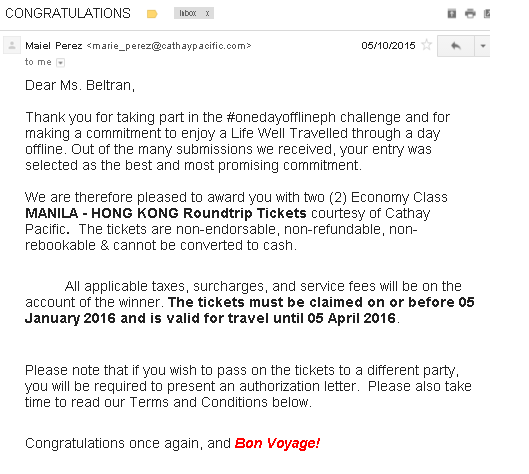 Speaking of, do you know that I recently got a roundtrip ticket to anywhere in the Philippines courtesy of Cebu Pacific? You can read here how I got it after I filed a complaint against their online paying system. I was not in a hurry that time so I just walked slowly checking out everything. While checking the big signboards, I noticed that they have an on-going Instagram contest going on. There is a question that they want to get answered: If you have a day without Internet and access to all gadgets, what would you do? 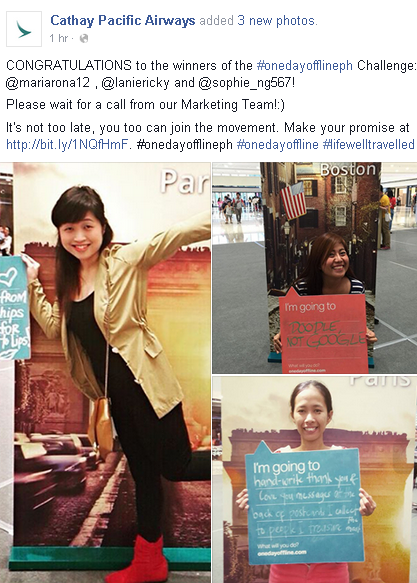 This is in connection to the #onedayofflineph that they are promoting. They’d like to remind us to at least once, unplug and get offline to feel the world. So there, I went ahead and had my photo taken. I wrote in a piece of blackboard using a pentel pen, my answer. I didn’t expect to win because there are hundreds of people joining that time. 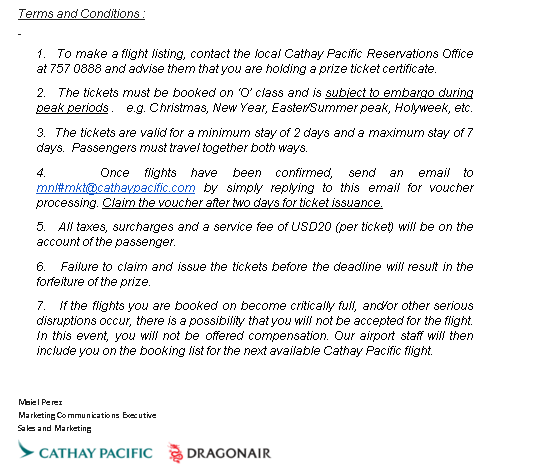 Actually this is the second time I already won from Cathay Pacific Air’s Instagram contest. The first one, I won two pieces of customized luggage tags sent all the way from HK. You can click here about it. I initially wanted to bring my mom since the prize is two roundtrip tickets Manila to HK flight vouchers. She has too much responsibility and that all of my siblings are not available on the flight dates I have chosen. My stay in Bicol for one month also made me forgot of its approaching deadline of redemption. I always travel alone – it is fine with me but since there is a spare ticket, I’d like to put it into a good use of course so I decided to look for a travel buddy. I know HK is an expensive country but I am not planning to spend too much to its luxurious side. I’d rather eat in clean street food stalls and go culture – exploring than see the high end attractions of Hong Kong. I also plan to go to Macau at least for a day or a night since I see that it is near each other. YOU SAID IT IS FREE, WILL THERE BE ANY OTHER FEES TO PAY? Good question! Cathay Pacific like I mentioned is no budget aircraft. They use Boeing – 777, the world's largest twinjet and has a typical seating capacity for 314 to 451 passengers. I have already called the Marketing department, I was told there’s some tax and surcharges that should be paid. 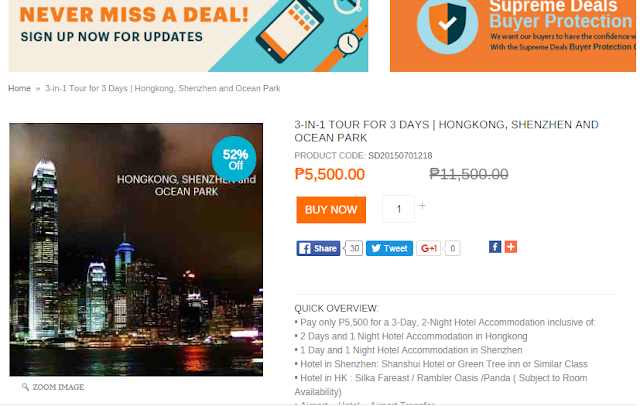 Per ticket it costs Php3700+. The Mnl to HK ticket comes with free breakfast and the HK to Mnl says with refreshments . You don’t have to worry, I will pay mine. You just have to pay for yourself. HOW ABOUT ACCOMMODATION AND TOURS? Someone who is not maarte, always game to take mobile photos and one who travels on a backpacker budget like me. I prefer a girl companion but doesn't hurt to try. Let me know! This flight is non-rebookable, non-refundable and non-transferable. Once booked and paid, it cannot be changed for whatever reason. I need someone who is sure enough to go with me. WHEN IS THE OTHER FEES TO Php3.7k to be paid? Anytime this week. Deadline has been extended this week. I prepared a short google form where you can tell me why should I pick you and what can you share in exchange of the free roundtrip flight? Please click here your answers. DISCLAIMER: This is not a contest. I will be the one solely responsible for the travel vouchers when it comes to decision - making and will personally choose the one who I think qualifies the most unless any of my family members change their mind while I am in the process of looking for a replacement. Such a pity that your mom can't go. Especially for a first trip out of the Philippines, HK would have been a very exciting destination. Best and cheapest thing to do is take the ferry from HK island to Kowloon (mainland) at night. The view is simply one of the most stunning in the world. Best of luck with finding a nice travel companion. If I was available on those dates I would put my name down, but I am sure that the competition would be too hot, and I am never lucky with that sort of thing ! Maria's #1 Fan in London. There is always next time around :) Yeah I am sort of rushing since the deadline given is really near. Other than throw the spare ticket in thrash, might as well have someone use it to travel to HK. Hi Rona! I filled out the form your link. It would be nice to meet you before you can make decisions.